Spliff Seeds cultivating quality cannabis seeds since 1995. 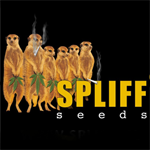 Spliff Seeds is created for growers, collectionists and medicinal marijuana users that need the highest quality cannabis seeds. The Bronze (B) and Silver (S) Line holds Spliff Seeds\' regular cannabis seeds collection. And the famed Gold Line (G) consist of their feminized seeds collection.